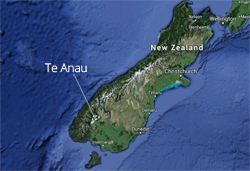 If you want to rent a holiday home in Te Anau or Manapouri you are spoilt for choice. There are lots of holiday homes to rent, and in the winter season you can get some really great deals. In the summer it's a good idea to book ahead but you can still pick up houses at the last minute sometimes. Some holiday homes (also known as baches in New Zealand) are quaint and built some time ago. Many of the holiday homes closer to the main street are of this type. Other holiday homes are brand new houses, often with great views because they are built on the outskirts of town in the newer suburbs. Some accommodation providers have built several holiday cottages on one plot of land, and market these through their own websites. Fiordland Holiday Houses are the perfect base for a Fiordland stay. Each house is self-contained, independent and has private gardens ideal for families. They are homely, warm, fully furnished and include many modern conveniences. All linen is provided. Fiordland Holiday Houses are located conveniently close to the lake fronts and town shops. We are family friendly and will do our best to accommodate your requests. Come and enjoy the true hospitality of southern New Zealand. Phone us on 03 249 6987 or cell 027 316 0459.